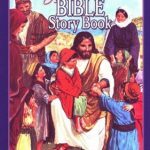 If you’re looking for children’s Bible story books to read with your kids, you’re in the right place! While my Christian faith is not usually a focus of this blog, it is central to my life. Each evening, our family gathers on the two couches in our living room. My husband reads the Bible story, we talk about it, and we say a prayer and sing a few hymns. Sometimes our toddler (who had his own devotion and was already put to bed) is shouting from his crib. And sometimes we have to remind (and remind) our children to pay attention. But overall, they listen well (with a fair amount of fidgeting). They answer questions and ask good ones. Each Saturday, they offer their own prayers. And they’re learning a beautiful variety of Christian hymns. Most importantly, they’re learning about their Savior. 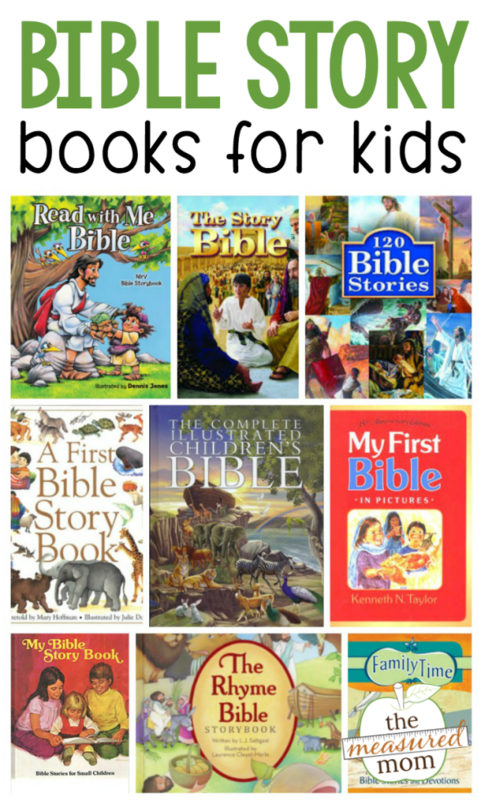 Many friends and readers have asked which Bible story books work well for families. Today I’m sharing the books that we have used with our own children, currently ages 2, 4, 6, 7, 9, and 10. We look for books that stick very closely to the Bible itself. While some of our books do add a little bit of extra detail here and there, we like it to be a minimum. We choose books with engaging text and pictures. When possible, we choose books that are appealing to different age levels. We choose books that do not contradict biblical doctrine. 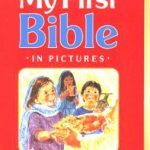 My First Bible, by Kenneth Taylor, is the first Bible story book we use with our kids. The stories are super short and written with toddlers in mind. Ideal for kids ages 0-2. 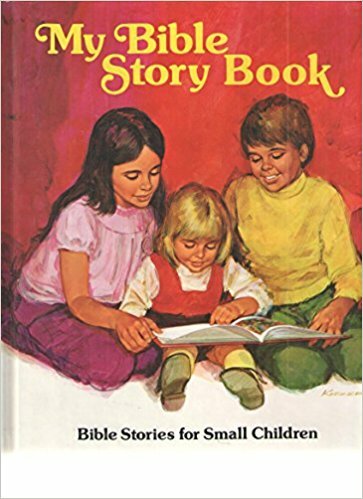 My Bible Story Book, by Sarah Fletcher, is a favorite from my childhood. It’s the perfect next step from Taylor’s book. This is one of those books that adds a few things to the stories – but not too much (usually). I love how the author keeps Jesus as the center of the book, even with Old Testament stories. Ideal for ages 3-5. 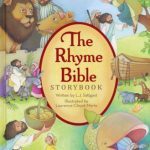 My only complaint about The Rhyme Bible, by L. J. Sattgast, is that’s too short! I adore the illustrations and the lovely rhyming stories. Our kids really liked this one as 3 and 4-year-olds. 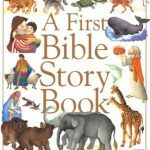 A First Bible Story Book, by Mary Hoffman, only has 14 stories – so it doesn’t get us very far. Beautiful illustrations adorn the child-friendly storytelling – making this book perfect for your regular bookshelf. Pull it out any time, not just during family Bible stories. I recommend it for ages 2-4. 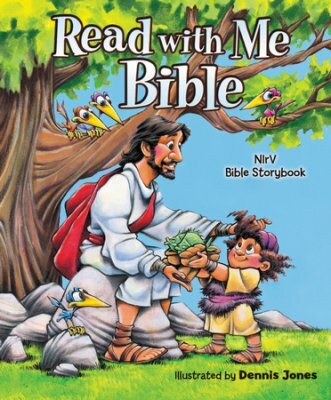 The Read with Me Bible, published by Zondervan, was our first fat Bible story book. 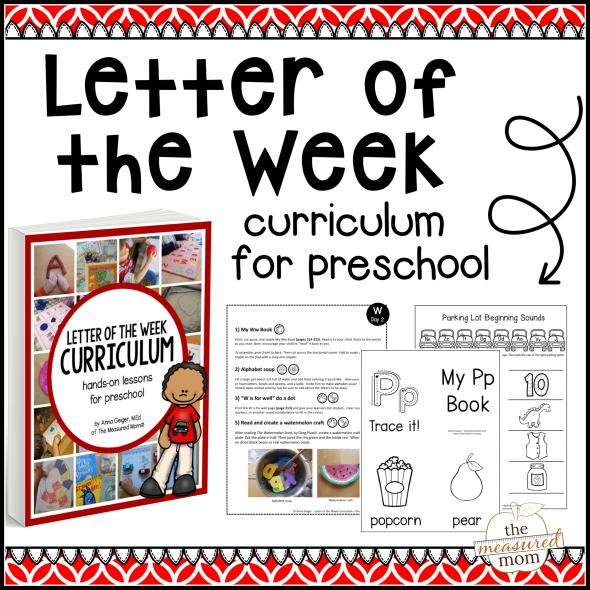 At first we hesitated to use it because the pictures are cartoony and sometimes just plain silly – but the stories are well written, and the illustrations certainly keep our kids’ attention! Ideal for ages 3-6. One thing I love about The Complete Illustrated Children’s Bible is that it has so many stories. It goes beyond familiar characters like Moses and Jonah to include many lesser known Bible characters and stories. I do want to say that it has a very straightforward (somewhat boring) way of telling the stories. It also fails to mention Christ in many opportune places. If you feel comfortable adding that in yourself, it’s a good choice. I recommend it for ages 5 and up. 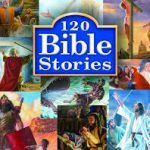 120 Bible Stories is a great choice for older listeners. There are fewer pictures, but they’re extremely well done and full of interesting detail. I love how each devotion offers a short Bible passage to memorize. I also appreciate the questions at the end of each story. I recommend the stories for ages 6 and up. Egermeier’s Bible Story Book is a republished classic. The 312 (!) stories are beautifully told and doctrinally sound. The only challenge we have with this book is that the stories are often too long for our younger kids, and there isn’t a picture for every story. I recommend it for ages 6 and up. It really is a treasure! 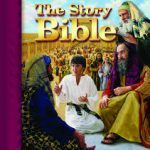 The Story Bible is a large Bible story book with stunning illustrations. I love that the stories come directly from the Bible, and I especially love the question, suggested activity, and prayer at the end of each story. However, I find it odd that the editors worked so hard to make the book one that kids could read themselves – but included much of the stilted language of the ESV translation of the Bible. Some of it is so awkward to read (and incomprehensible to our kids) that we have to revise the stories as we read aloud. Family Time is the book we’re currently reading with our family, and it’s fantastic. I love that the left side of each page is a Bible story, and the right side is an application story. It’s told in language that my 4-year-old understands, but it’s still engaging for my 10-year-old. The stories are Christ-centered and Biblically solid. Highly recommended for ages 5 and up. 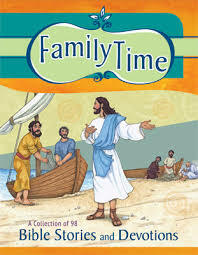 Younger children who are experienced Bible story listeners will enjoy it as well. I hope you found some Bible story books to use with your children! I’m glad you can use it, Kate! 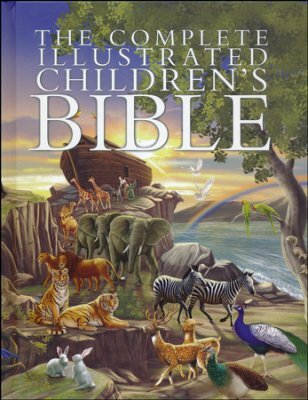 We just made the decision to homeschool our children (ages 5,3, and 1) and I was just scanning Amazon looking for possible Bible books to use in our curriculum. Your list confirmed a few I placed on my wish list and introduced me to a few more! Thank you! Anna, this is fantastic!! I’m so sorry about your miscarriage. Rough. Your ideas for meal prep are wonderful and I’m sending them to my children. How very kind of you to share about your evening schedule. We had evening prayers and that was it, which isn’t enough. I’m sending what you do to my daughter for her young family in hopes that she emulates you! She is also a strong believer in Jesus. Thanks again for the glimpses of how you handle your large family. We love The Story Bible! The pictures in particular are so much better than other books. My niece calls some of the illustrations in some Bible story books “dollies”. That’s not exactly what we want young children to think about Jesus and the other Bible people! The text is good too…we usually read it aloud and then talk about confusing things, so it works.